There's nothing quite like new knitwear to make you winter-ready. Cosy, stylish and practical, jumpers tick so many boxes when it comes to versatility—and almost every girl in our team is fully obsessed, trying to wear theirs as often as possible and buy new versions as soon as they drop online. Not only is a great jumper the key piece to many outfits—think crew-neck knits worn with silky slip skirts and boots, or roll-necks layered under floral sun dresses—a knit is a weekend wardrobe saviour when worn with off-duty denim. Rather than showcasing every single covetable sweater on our wish list right now (it's that long), we've split our best knits into five easy-to-shop trends. Scroll below to see (and shop) the best jumpers for cool women everywhere. Style Notes: When it's not quite cold enough for a chunky knit but there's definitely still a need for a knit, try something lightweight, slim-fitting and ribbed. Crew-neck shapes that sit just below the waist are perfect for tucking into jeans and high-waisted trousers. Or why not swap your logo tee and style your ribbed knit under a blazer? Style Notes: There's nothing quite like wearing a jumbo knit when it's freezing out. 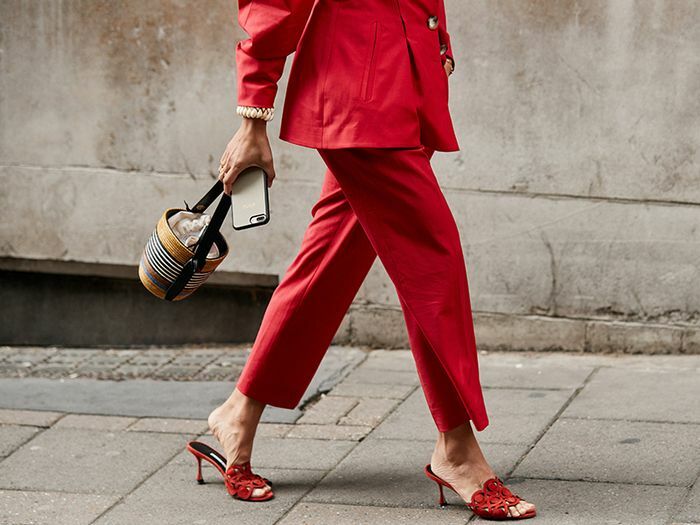 This season, a chunky iteration worn rolled up on the sleeve and half-tucked into midi skirts or jeans with trainers is still the look du jour. Style Notes: If you didn't buy into this trend last season, now's your chance. A jumper (crew neck, oversized, cropped or roll-neck) with balloon sleeves or a slight amount of volume on the arm is a surprisingly good off-duty wardrobe essential because it still makes an impact but is essentially sloppy and easy to throw on. Style Notes: While a V-neck knit is always a handy option for layering, we're ready to embrace the full-on high neck. Choose between something neutral and classic for work, or try a directional shape (hello, Balenciaga) or a punchy bright. Just add bold earrings, a printed skirt or white jeans and slouchy boots to finish. Style Notes: Though we often enjoy a trend-led style, sometimes it's the classics we turn to, and there's nothing more classic than a cable-knit jumper. Cream will always be ideal for mixing and matching with your current wardrobe wears, but should you be looking to embrace colour this season, try Prada's pink iteration and style with wide-leg trousers and trainers. Next up, 45 under £100 buys you'll need in your life.